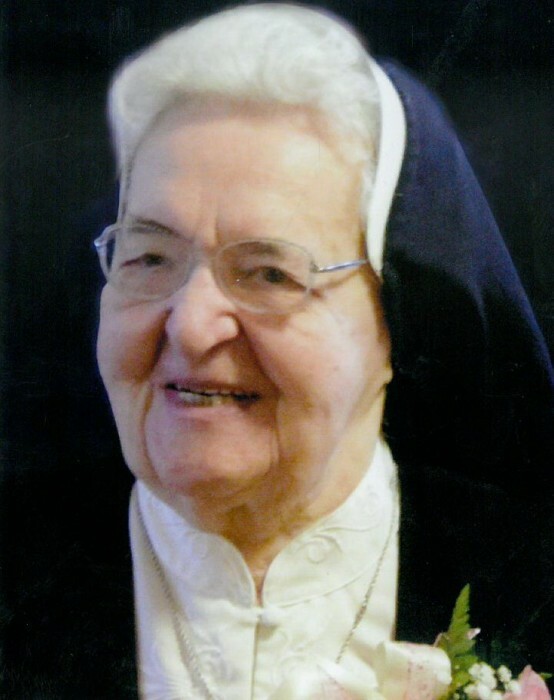 Sister Mary Illuminata Godlewski, SSJ-TOSF, age 101, passed away on March 26 , in the midst of her loving family, Sister friends, Sister Catherine Britton and Sister Noel Novak, with whom she had worked and lived for the past 61 years. Sister Illuminata was born in West Rutland Vermont in 1917 to Alex and Sophia Godlewski (nee Lipska). She attended grade school at Nativity BVM in Lorain, Ohio. She had been a Garfield Heights resident for more than 61 years, having taught at Marymount/Trinity High schools for all those years. She was predeceased by sisters, Helen (Leo) Stronsky and Janet (Elmer) Siek, and her brothers, John (Adelaide) Godlewski, Joseph Godlewski, Walter (Margaret) Godlewski, and Robert (Judy) Godlewski. She is survived by her brother, Stanley (Claudia) Godlewski, 17 nieces and nephews and 45 grand nieces and nephews. She is also survived by the Sisters of St. Joseph of the Third Order of St. Francis, with whom she shared her life for 85 years. She was a beloved teacher and friend of hundreds of graduates of Marymount/Trinity High Schools in Garfield Heights, where she taught business courses and served in various other positions during her tenure at both schools. Once you met her, you never forgot her! She was a favorite to most and an excellent teacher to all. She taught, and her students learned! She was an unforgettable person! Friends may call at GOLUBSKI DELIBERATO FUNERAL HOME 4747 TURNEY RD. CORNER of GARFIELD BLVD. FOR VISITATION ON FRIDAY, APRIL 5, 2019 FROM 2:00-8:00 PM. Family and friends are asked to meet at St. Monica Church, 13623 Rockside Rd, Garfield Heights, OH 44125, where a Mass of Christian Burial will be celebrated on Saturday, April 6, 2019 at 9:30 am. Interment Calvary Cemetery. Donations, in her memory, may be made to her scholarship fund at Trinity High School, 12425 Granger Rd. Garfield Heights, Ohio 44125 or to the Sisters of St. Joseph Third Order of Saint Francis, 12215 Granger Rd. Garfield Heights, Ohio 44125.